Hi, we are Paul & Helen, husband and wife wedding photography team. We are based in Fletchertown in Cumbria and cover the whole of the lovely Lake District, weddings in Sheffield and the whole of Yorkshire! 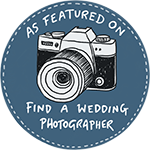 We love to photograph weddings naturally – no cheesy poses needed. Drop us a message if you would like to chat more about your wedding.